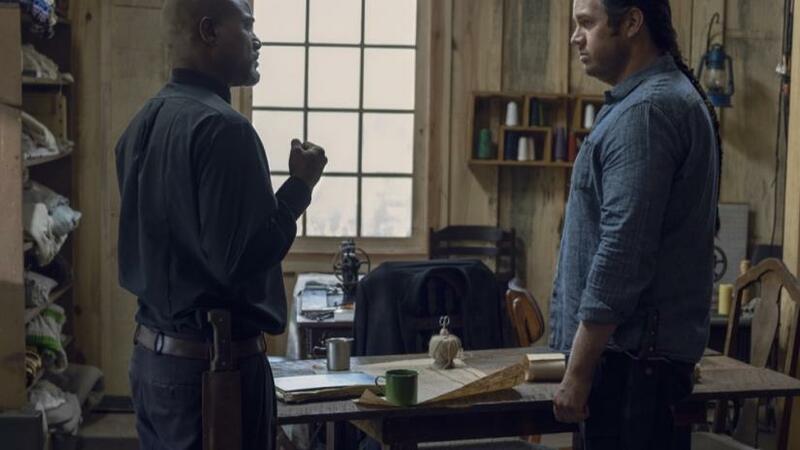 Alpha (played by Samantha Morton) questions Lydia (played by Cassady McClincy) about the Hilltop’s supplies, defenses and why they wanted to fight to keep her. Lydia gives some information and claims she lied about needing help escaping; Alpha is furious that she risked coming to get Lydia and she has little information. At Alexandria, Michonne (played by Danai Gurira) berates the council for risking people to set up Gabriel’s (played by Seth Gilliam) communications device. Gabriel and others object to Michonne overriding their votes and want to participate in the Kingdom’s fair after hearing Carol (played by Melissa McBride) describe their dire circumstances, but Michonne refuses to risk Alexandrian lives. Rosita (played by Christian Serratos) talks with Gabriel about her pregnancy by Siddiq (played by Avi Nash) and that it’s up to him if he wants to help raise the baby. Eugene (played by Josh McDermitt) not so subtly tells Gabriel he shouldn’t let Rosita go because of his mixed feelings about the baby. Henry (played by Matt Lintz) finds the Whisperers camp but is quickly discovered, Lydia hits him to feign indifference but Henry is taken prisoner. When they arrive at the Whisperers camp Henry is shocked to see they have many members. There is no shortage of drama around Alexandria, Michonne has turned herself into a dictator and there’s relationship drama everywhere. The pregnancy storyline was briefly introduced a few episodes ago and now takes up nearly half the episode. Eugene loves Rosita, who loves Gabriel who isn’t sure how he feels about Siddiq or the baby. These are all tertiary characters and its hard to care one way or the other what happens. 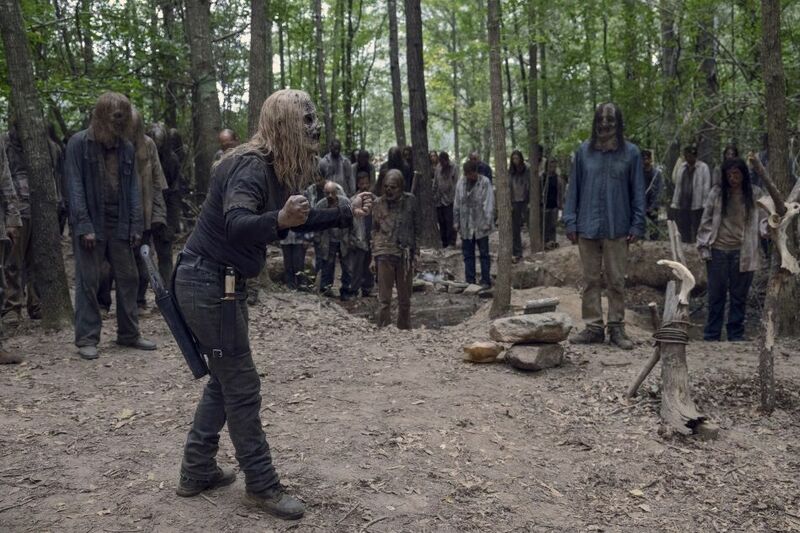 Getting our first glimpse of the Whisperers camp is a much better storyline but its sidelined for the first half in favor of the Alexandria drama. Gabriel and Rosita have been on the show for several seasons but never broke out and became characters you care about. Hopefully this is the last episode to spend lots of time on the pregnancy story since there are much more interesting characters and storylines to focus on. Michonne goes to Negan’s (played by Jeffery Dean Morgan) cell after he returns, she correctly deduces Negan only returned because he had no choice, but he claims she could learn to trust him given that he didn’t hurt anyone. Negan tries convincing Michonne he could be useful, but it falls on deaf ears. Michonne sees Judith (played by Cailey Fleming) and is shocked that she talks to Negan and sees him as a human being, failing to convince Judith otherwise. Several Whisperers express anger that Alpha risked them to save Lydia despite their previous rules of leaving lost people behind. Alpha’s second Beta (played by Ryan Hurst) defends her when two people challenge her to take over as leader. Alpha beheads the woman to assert her dominance and gives the head to her boyfriend before stabbing him to death. Alpha talks to Beta and worried she might be losing control of the Whisperers, he assures her that isn’t the case but is worried about Lydia’s feelings for Henry. Alpha shuts down the dissenters. Negan did his time and wants to rejoin society; he was locked up for most of Judith’s life which is why she sees him as harmless. He’s clearly not the same man but Michonne would have been an idiot to take him seriously even though a caged Negan is not as fun as when he is roaming free. Alpha proved why she’s gone so long being the leader with her (literal) cutthroat method to leadership. Keeping her walker mask on while she berated the unmasked Whisperers made her look much more terrifying, it shows how Alpha has become more primal then human. Alpha loves Lydia but its more of a possessive love and with Lydia causing her problems she may not see the need to keep her daughter around. Rosita, Siddiq and Gabriel seem to reconcile while Eugene sadly watches them. Michonne goes to Aaron (played by Ross Marquand) and tells him she won’t veto if the council wants to attend the fair, reasoning it’s their right to make up their minds themselves. That night Alpha tries to force Lydia to kill Henry to prove her loyalties or they’ll both die, but actual walkers invade the camp and begin killing Whisperers. Daryl (played by Norman Reedus) having caught up with them and lead the walkers in escapes with Henry and Lydia after Henry refuses to leave without her. This whole situation with Rosita’s baby is like a sitcom but not one Id’ watch. Michonne is loosening the reigns but you can see expects it will end badly; with people in walker skins hanging around she’ll probably be right. Alpha doesn’t mess around when her life and leadership is on the line. Daryl leading in a herd of walkers to devour the Whisperers is delicious irony. Given that her mother was ready to let her die Lydia had to go but now Alpha will be coming not to save her but for revenge. Michonne has gotten cold lately. Henry and Lydia are about to set off a war so they’re relationship better be worth it.